After an overnight sail from Portobello against the current(!) 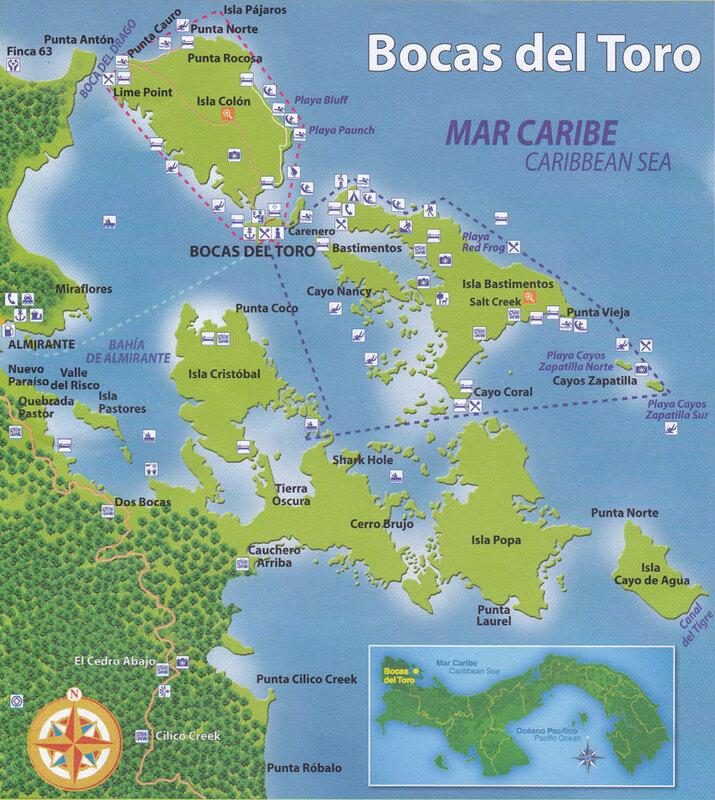 we made our way West into the Bocas del Toro archipelago in the NW corner of Panama, near Costa Rica. We had been here back in 2014 by land so knew the area but had never cruised the waters. 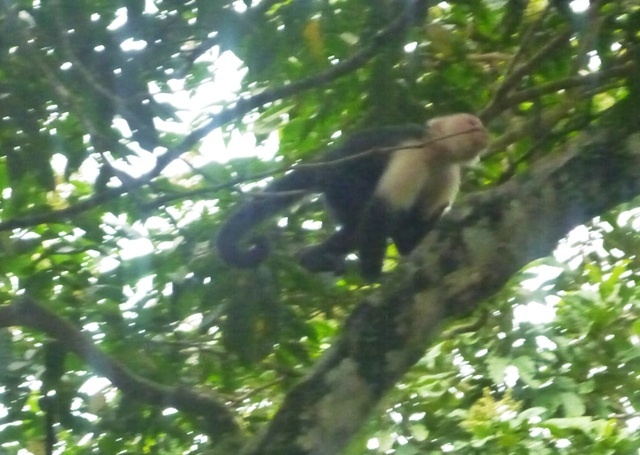 We are sure you have heard of and tasted Chiquita bananas, well guess where they are from; yes here in Bocas del Toro. 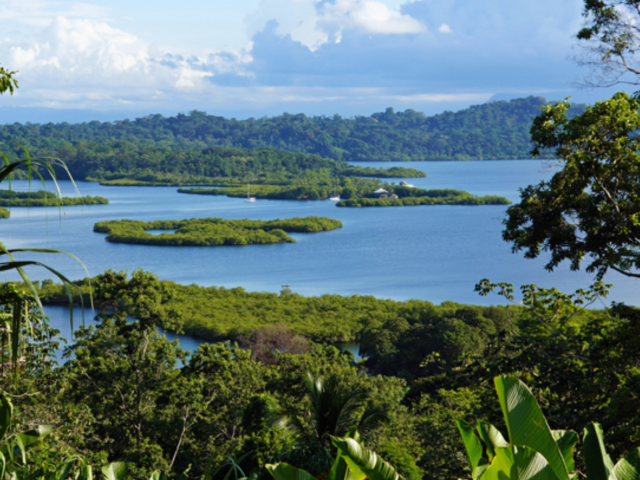 Back in 1890, 2 brothers planted banana trees along the shores of Chiquiri on the mainland near Bocas. Their company was eventually taken over by United Fruit and became part of Chiquita Brands Intl and now this area grows and exports 3/4 of a million tons of bananas annually. These didn’t get exported – yummy! This area does get a lot of rain but what we found interesting was that August / Sept when we are here is lower than the rest of Panama. 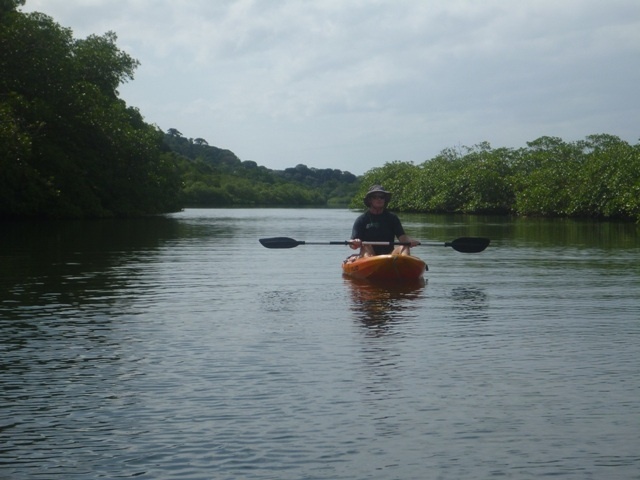 It’s wettest here during Panamas dry season (Dec. – April) and drier during Panama’s rainy season. May have got something right!  Had a couple of thunder storms rumble the boat but all up it was reasonably dry so we could get out and do things. 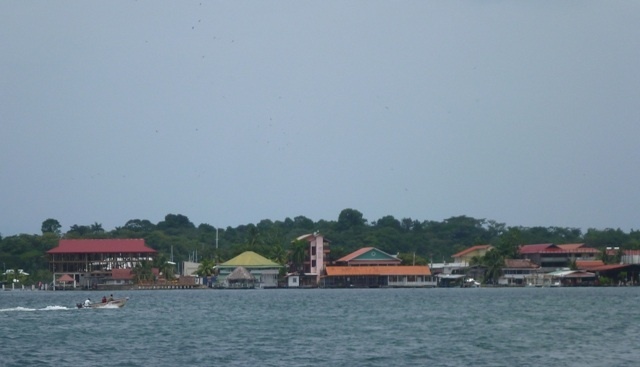 Isla Colon is the most developed of all the islands in the area. 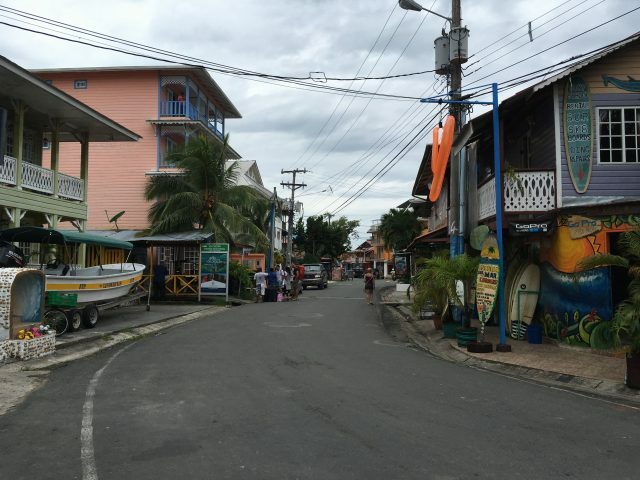 The town of Bocas has a real relaxed pace of life with lots of backpackers, surfers, expats and locals mingling in the many bars and restaurants around town. 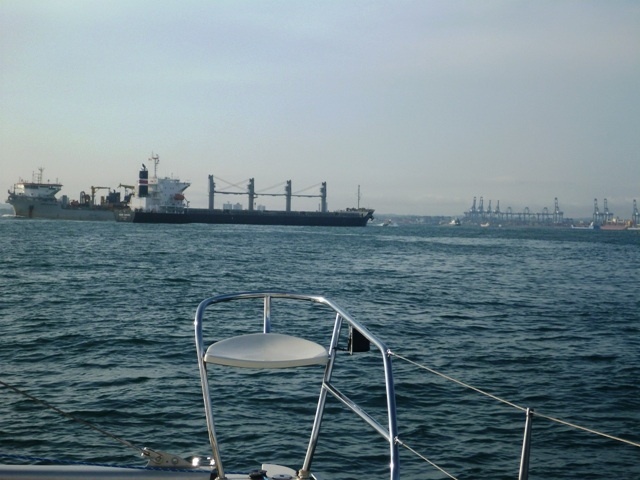 We couldn’t believe the number of Chinese owned hardware stores in town, with lots of marine parts to help cruisers and expats working on their boats and homes. Of course there are also lots of tour operators on the waterfronts ready to take you out in water taxis to see and enjoy the islands. 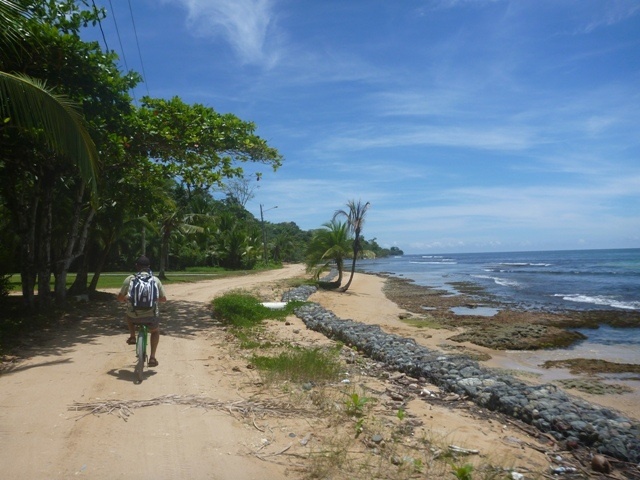 We hired bicycles to go out to Bluff beach on the windward side of the island. The ride was about 40 min starting on a road and went along the coast eventually ending on a sand trail that was a tad difficult to cycle. We passed plenty of restaurants so knew we had options to stop at on our way home. Yes it was HOT! 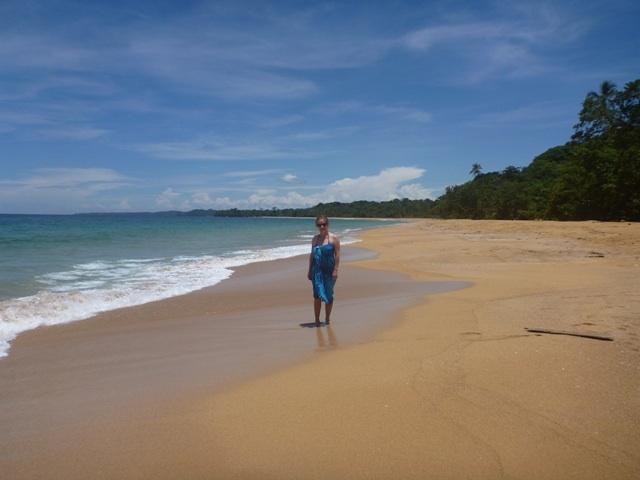 The beaches here have golden soft sand and the water is lovely, a real treat after a hot cycle. Golden sand at Bluff beach and no ones here. 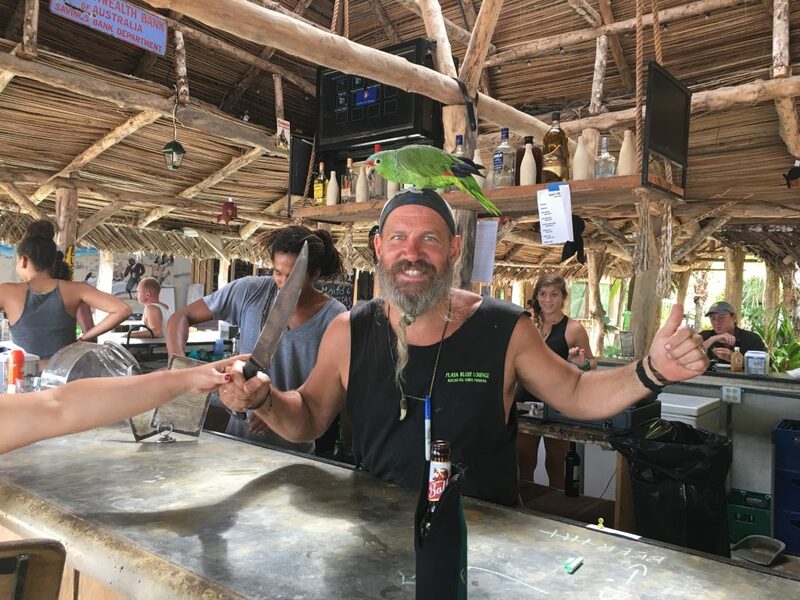 We couldn’t resist stopping for a cold one at Scully’s on the waterfront on the way home to meet Steve the owner / pirate with one leg and Milton the parrot. 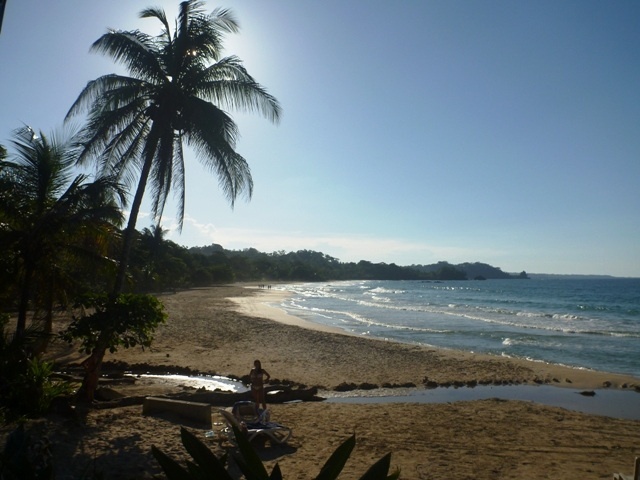 We took the boat around to Starfish beach (or Playa Estrella) on the leeward side of the island for quite a few days. 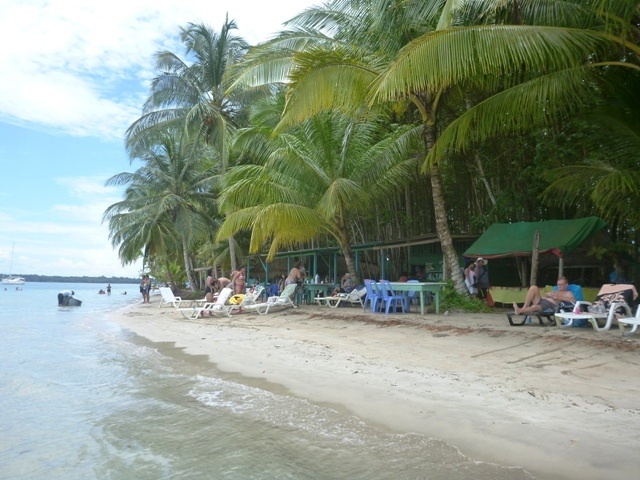 Lots of tourists get brought here to laze on the beach, listen to music and eat at the beachside restaurants set in amongst the coconut trees. Even we went ashore for some beach time. Lots of starfish about hence the name. 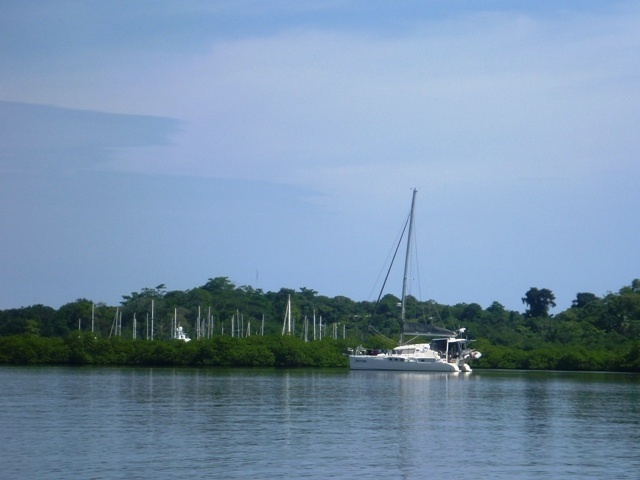 This island is the largest island here and is really lush green (perhaps thanks to rain all year long) with some nice protected anchorages amongst the mangroves. No mosquitos too, which was a treat. 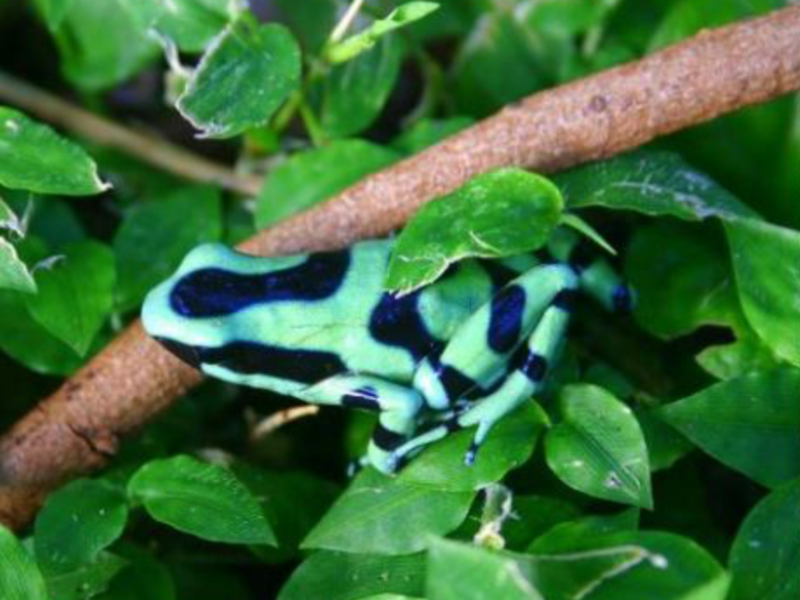 We even managed to see a brightly colored poison dart frog, thanks to someone pointing it out. 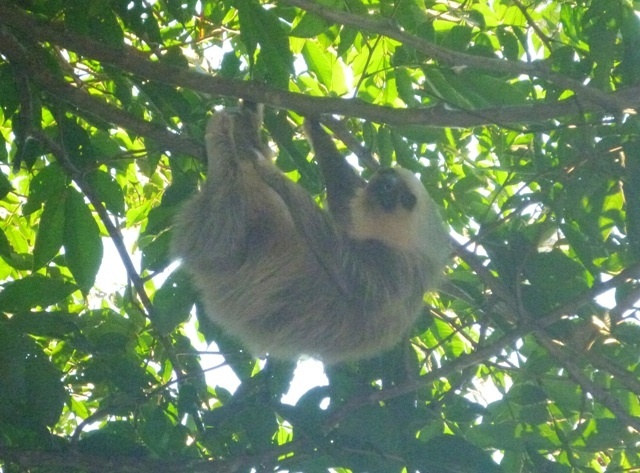 Walking through the lush forests of the Red Frog Resort & Marina grounds you pass this sign, “Monkey Crossing” and sure enough we saw a family of monkeys using it and lots of sloths lazing in the trees high above us. Very cool! 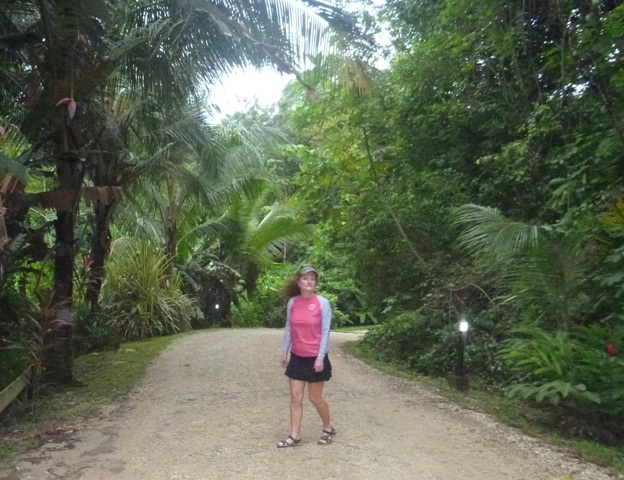 There are some beaches on the windward side of the island, which we liked walking along. The tourist boats love taking tourists to Red Frog and take them to a special dock where they have to pay $5pp to walk across some trail to the beach. 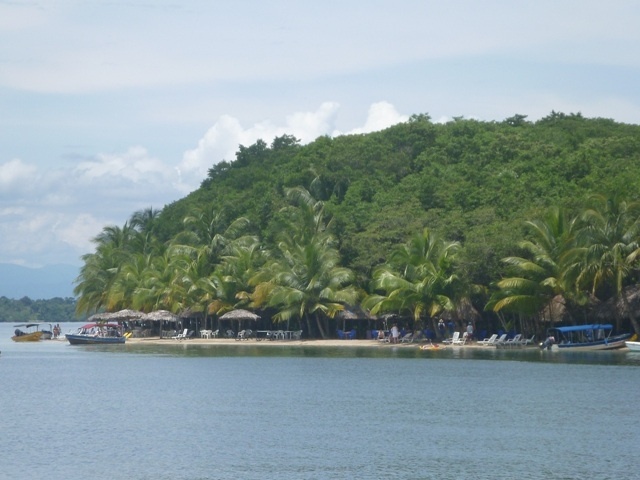 We’d kayak into the resort dock daily and ask to walk thru to the beach and it was free. Bonus. 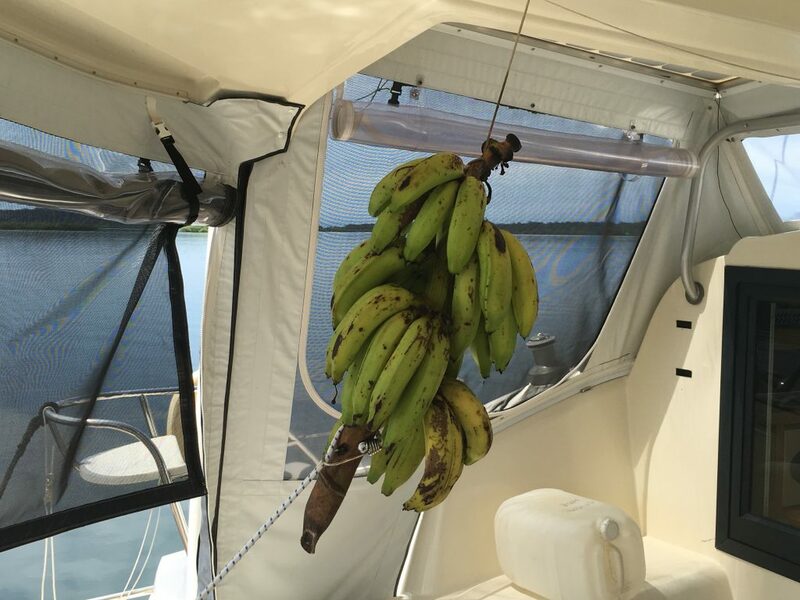 After making our way thru a small channel between Bastimentos and Solarte called The Gap, which has some pretty large American style homes being built, we anchored on the south side of Cayo Solarte. 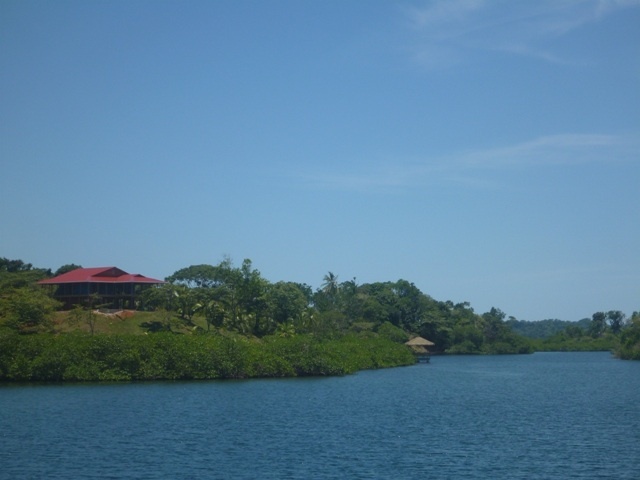 The mangroves are low lying and actually are very picturesque when you look across to the mainland. 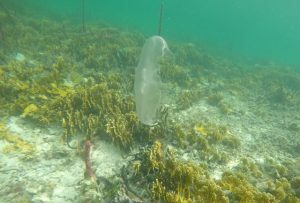 We had heard the snorkeling was good on the reefs in the area so went searching. 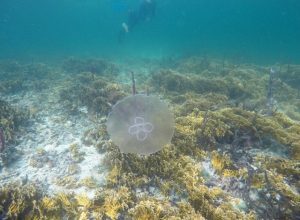 We found more jelly fish than anything. After cruising to some of the other areas like Dolphin Bay, Johnson Cay and Crawl Cay we made our way out to the Zapidilla Cays; 2 cays that are part of a National park. Very pretty and busy with tourist boats during the day. 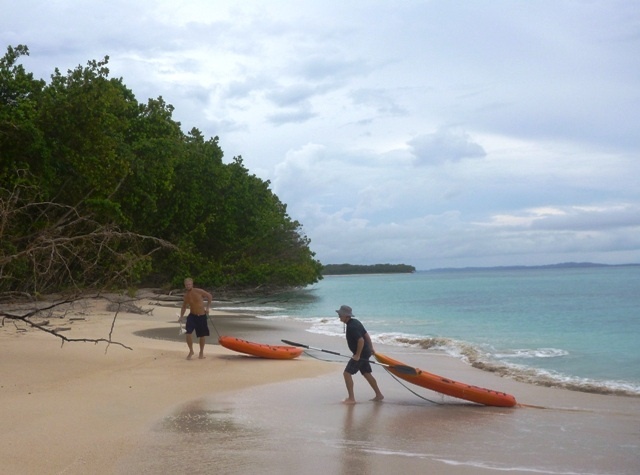 We kayaked ashore (cost$10pp) and ending up meeting Ben who is stationed on one of the Cays to research turtles. He was in need of a cord to charge his cell phone so we helped him out and in return he invited us back that evening to watch for turtles coming ashore to lay their eggs. Alas we didn’t see one come ashore but did see tracks. Interesting experience. We’ve arrived in the busy Colon area. 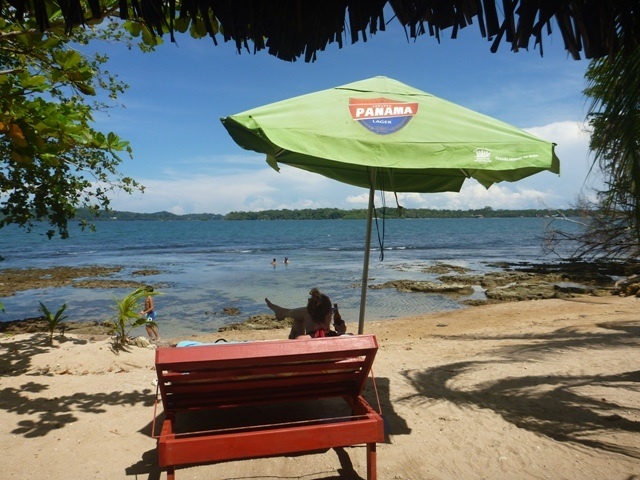 This entry was posted in Panama and tagged Bocas Del Toro, Panama by Teresa. Bookmark the permalink.